The problem for our president is that despite the Trump Organization’s failure to track some foreign cash that it receives, we don’t live in the same economies as those in repressive regimes in China and Russia. The free market has far more room to operate here (too much, really), and hotel prices are reflective of movements in supply and demand. There was some evidence early this year that Trump was hurting American tourism overall, and now Oliver Smith—the digital travel editor of The Telegraph—produced a report suggesting that Trump’s hotels are also losing ground, as room rates are down by an average of 36% at his resorts. Here are 10 examples, per the ones advertised on Trump’s own web site. Note: The Telegraph published these figures in pounds, and everything has been changed to dollars as of the current exchange rate of 1.32 US dollars per 1 British pound. To try to corroborate their findings, I searched for a room on Hotels.com on Saturday, December 2nd (12 days from this writing). The Telegraph’s 2017 figure came from FairFX, their 2018 figure came from their own reporting, and my figure is simply the average of the available rooms on one of the most expensive nights of the week during Christmas season. Trump isn’t just beefing with the NFL on Twitter, as his hotel is actually suing an NFL player—Tennessee Titans linebacker Justin Staples—over some kind of payment dispute about Staples’ wedding reception. Additionally, this Chicago hotel reneged on a low price someone booked on Booking.com. It was such an egregious mistake that even Fox News reported it. But that space — described as “un-leasable” to the Cook County Assessor when it comes to getting a property tax reduction — is transformed into “breathtaking” opportunities for potential tenants in the marketing materials that were on the RFK website Friday. The condominiums that Trump sells in these units can be found at a discount nearly everywhere you look in Chicago. For this column, I googled “Trump [city] hotel” for all ten, and this was the only one where advertisements for condos continually popped up on every search page. Others, like his D.C. hotel, came up for more—shall we say—criminal reasons, but the story of this tower in Chicago is that nobody likes it, it doesn’t look like it makes any money and the average rates are all going down. This is the only one of the bunch to see an increase in room rates, although Hotels.com is far cheaper than what these Britain-based researchers found. We could list any of his other hotels here like Turnberry (down 57%), Macleod House & Lodge (down 10%) or Albemarle Estate at Trump Winery (down 31%), but it’s not one that Trump wants us to judge him on, so we’ll stick to his game plan. However, I would be remiss if I didn’t point you towards this review in the Irish Times of Trump’s hotel where they found “scores of fake Michael Kors bags, wallets, Hollister and Superdry T-shirts, sweatshirts and hoodies on sale at the Doonbeg Christmas Market.” Fake high-end merch sold at a Trump property—how apropos. Oof. The Telegraph’s headline of “Room rates at Trump’s hotels have fallen by up to 63 per cent since he became president” comes thanks to this property. 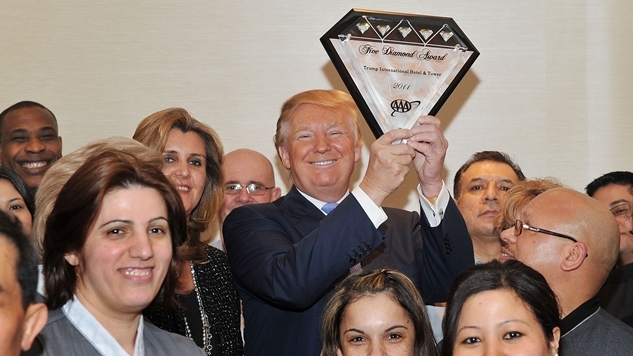 Fun fact: the National Labor Relations Board found Trump’s Vegas hotel guilty of breaking the law by refusing to recognize its employees’ labor union—who make roughly $3 per hour less than other unionized workers on the Las Vegas strip (bonus fun fact: Trump’s team asserted that the union rigged the election to unionize, sound familiar?). My figure is inflated by a handful of thousand and two thousand-dollar penthouses, but most rooms available are around $200 and have had their prices cut by 25%. The collapse that The Telegraph found seems to be true here. Same dynamic here as his Vegas hotel—where a few penthouses drive up an average driven down mostly by 25% off deals. If you remove the most expensive penthouse ($2,089), the average price for a room next weekend drops by 23%. This is one of Trump’s favorite properties, and it was home to a famed PGA tournament (that is now fleeing for more dollars in Mexico City). It’s also his biggest revenue generator, which sets the stage for it to be ground zero for a lot of ethics violations. Like Las Vegas, fair wages for his workers has been a struggle, and Trump’s administration has the ability to change the law, so he can pay his workers less. Additionally, a new federal rule called The Waters of the U.S. gives the EPA and the Army Corps of Engineers authority over thousands of waterways and wetlands—placing them at odds with many golf course owners (Trump promised to repeal the rule during the campaign). If you came here for pure schadenfreude, then I am sorry, because the averages I found in our next three hotels contradict the narrative hidden in the rest of this column. The disparity in the rate I found versus The Telegraph’s is likely because mine comes before Christmas, which is one of the most touristy times of the year for New York City. There were only four rooms available when I checked. Trump is probably feeling pretty good about this property. That part required the plaintiffs to notify any investigative agency with which they “may have previously cooperated” that they did not want to “participate in any investigation or criminal prosecution” related to matters in the lawsuit, according to a confidentiality agreement signed by more than 20 people. The plaintiffs could respond to a subpoena or court order, but would also have to notify the defendants that they had received it, the agreement said. The criminal investigation was closed sometime afterward. Trump’s Bayrock financiers can be connected to the Kremlin by a couple degrees, and despite Trump distancing himself from Bayrock-connected people like Felix Sater, Trump himself had to sign off on this shady deal, since he has an 18% stake in SoHo (if you’re interested in how much of Trump’s businesses can be connected to Russia, I detailed that here at Paste back in March). December is the beginning of Panama’s busiest tourist season, so that explains part of the jump in price. There was also one presidential suite driving up the average, and if we remove that, it plummets down to $324, further corroborating The Telegraph’s findings. But to be frank, $100 swings in average room rates is not the chief concern of the Trump Organization with this hotel, as a broker selling these units was in business with a money launderer and two criminals from the former Soviet Union. Former Panamanian financial crimes prosecutor Mauricio Ceballos told NBC News that this hotel is “a vehicle for money laundering.” This won’t be the last time you hear about his property in Panama. There were A LOT of rooms available when I checked, and all the cheaper options were 25% off. This hotel is famous for being an example of how Trump lies nonstop. I employ many people in Hawaii at my great hotel in Honolulu. I’ll be there very soon. Vote for me, Hawaii! The Trump business model is to make other people do all the hard work, license out his name for a fee, then claim that he owns the joint just because he slapped his name on it, all while hiring shady people to sell several floors of condominiums in the building. In a way, it’s a fitting metaphor for his presidency. Trump’s D.C. hotel’s average room rate is 24% lower than the average of other luxury hotels nearby like Hay-Adams, Four Seasons and Willard. Additionally, its occupancy rate is 42.3%, compared to 70% for the rest of the industry. Basically, no one is staying in his Washington D.C. hotel, and it’s making money hand over fist, largely thanks to Republican bigwigs getting hammered in the bar and buying up the most expensive rooms. WaPo reported that the internal documents they reviewed did not reveal much foreign money, but that doesn’t mean there wasn’t any. The Kingdom of Saudi Arabia paid this hotel $270,000 while it lobbied to roll back a U.S. terrorism law. The Republican Party is enabling this. The NRCC (whose entire existence is centered around electing Republicans), sent out an e-mail blast with a contest for “a lucky conservative (and a friend)” to stay at Trump’s D.C. hotel during the holidays. The building this hotel resides in used to be the Old Post Office, and is actually owned by the government. Ethics watchdog groups cite this hotel frequently as one of America’s most obvious kleptocratic concerns. So is Donald Trump’s presidency hurting his businesses? The share of bookings at Trump Hotels on Hipmunk as a percent of total hotel bookings are down, decreasing 58.46 percent compared to the same period last year. There are other examples too. Since Trump entered the presidential race in June 2015, revenues at his golf course in Los Angeles County have fallen 13%. Koi—a restaurant in Trump SoHo—shut down this year, citing a severe drop in business. Lastly, Forbes dropped him 220 spots on their list of billionaires, giving us further proof that despite Trump’s kleptocratic efforts, he has not been able to make up for the shortfall in overall demand. Thanks to all of these being private companies, plus the fact that Trump has not released his tax returns, we cannot be certain of Trump’s profits (or losses); but the fact that the Trump Organization is launching a new hotel chain—Scion—and not putting the Trump name on it may be all the evidence we need to prove that President Trump is hurting Donald Trump’s hotel business.